(Bloomberg Opinion) -- Here’s an interesting exercise: Compare what is arguably President Donald Trump’s signature policy achievement, the late 2017 tax cut, with perhaps his top policy goal, a wall on the border with Mexico, in purely numerical terms. Set aside for the moment all the political and social arguments about immigration and the border. 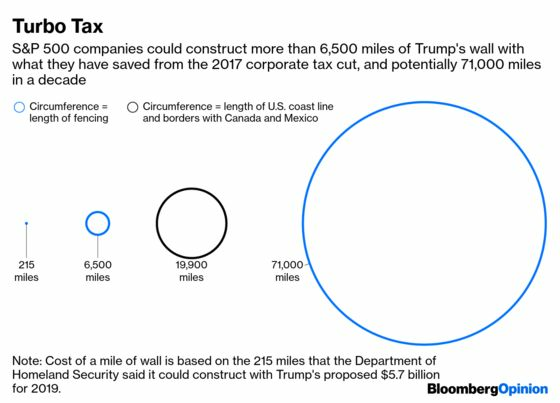 The companies in the S&P 500 have already saved enough to pay for a wall, based on Trump’s latest fencing plan, that could stretch the entire length of the U.S.-Mexico border and all the way across the Gulf of Mexico, twice, and still have $20 billion to spare. The savings could also pay for the government’s annual grant to the Special Olympics, based on current funding, for the next 9,696 years. The first quarter ended on Friday, and investors are bracing for what looks like a disappointing earnings season. Profits are supposed to shrink 3.6 percent on average for the companies in the S&P 500. But those earnings would have been worse without 2017’s Tax Cuts and Jobs Act, which saved the S&P 500 companies a projected $30.1 billion in the first quarter, based on analysts’ estimates, and $174.5 billion since the beginning of 2018, enough to pay for 6,500 miles of wall. Still, the sputtering corporate profits indicate the big tax cut is not delivering as advertised. Of course, the profit disappointment could be a good thing for the economy if it turns out companies put more money into workers’ pockets. There is some evidence of that, but not much. Wages are up 3.5 percent in the past year, according to the most recent jobs report, but that is after years of stagnation. The average monthly job gain has risen by about 35,000 positions a month since the tax bill. But job gains moderated last month to a gain of just 20,000 total, down from 2018’s monthly average gain of 223,000. And it’s clear that companies are diverting a lot of the tax cut windfall to their shareholders. 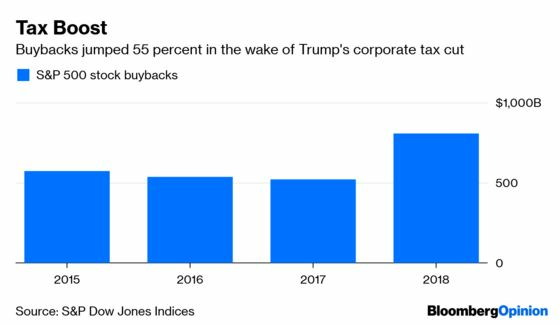 Last week, S&P Dow Jones Indices reported that the S&P 500 companies bought back $806.4 billion in shares last year, a record, up $287 billion from the year before, or roughly twice what companies saved from the tax law last year. But there is some good news for taxpayers. The projected cost of the corporate rate cut for the federal government, and ultimately all U.S. citizens, if it runs for 10 years as planned, has dropped $50 billion from just three months ago. Of course, the reason is because growth, in particular this year and next, will not be as strong as expected just a few months ago. Still, the tax savings for corporate America for the next decade could top $1.9 trillion, or enough for roughly 71,000 miles of fencing, which could wrap the continental U.S. three times, with 11,399 miles of extra fencing to spare. I estimated the cost of building a wall based on Trump’s $5.7 billion request for 2019, which led to the partial government shutdown. The Department of Homeland Security at the time said that that funding would allow it to build 215 miles of physical barriers along the border between Mexico and the United States. That translates into roughly $26.5 million per mile. S&P 500 companies have saved 1,000 times that in the past three months alone. As in the past, I calculated the tax savings of corporate America by looking at the projected tax provisions of companies in the S&P 500 for the first three months of this year, and comparing the rate they are paying this year with the average rate those same companies paid in the four years before the tax law changed. Tax provisions are not actual tax payments, but it’s a decent approximation. Companies are not required to disclose their actual tax filings. For the first quarter, Trump’s tax cut lifted profit for companies in the S&P 500 by a likely collective $30.1 billion. The average total tax rate paid by those companies was 19 percent, including all taxes they paid anywhere, not just U.S. federal income taxes. That number is based on the latest analysts’ estimates and could still change. The estimate is slightly more than the $29.9 billion in tax savings those same companies had in the first quarter a year ago. Of course, the absence of a tax cut would be no guarantee of wall funding because of those political and social arguments we set aside earlier. Nor is it clear how corporate profits or the economy would have changed without the tax cuts. Both could have been much more sluggish. But in terms of looking at the world in ways that Trump just might, the tax cut could buy a lot of wall.